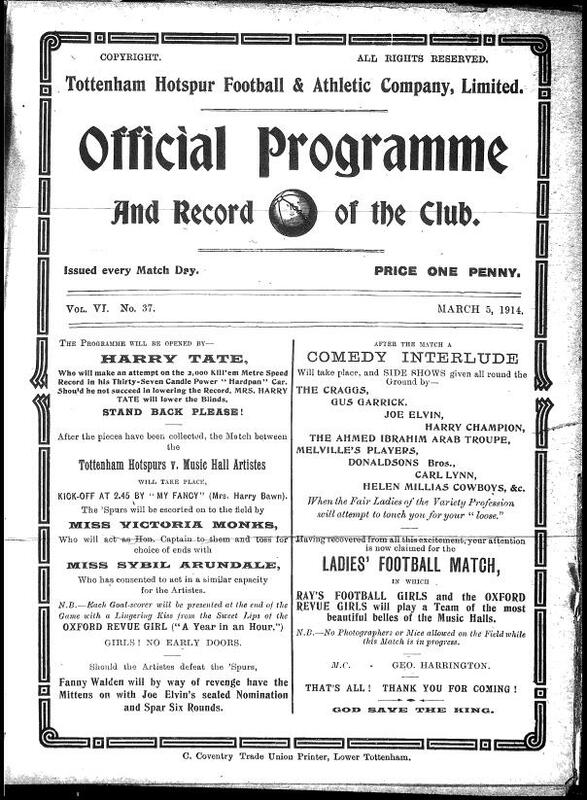 Before the First World War changed society for ever two of the most popular forms of mass entertainment in Britain were Association Football and the Music Hall. 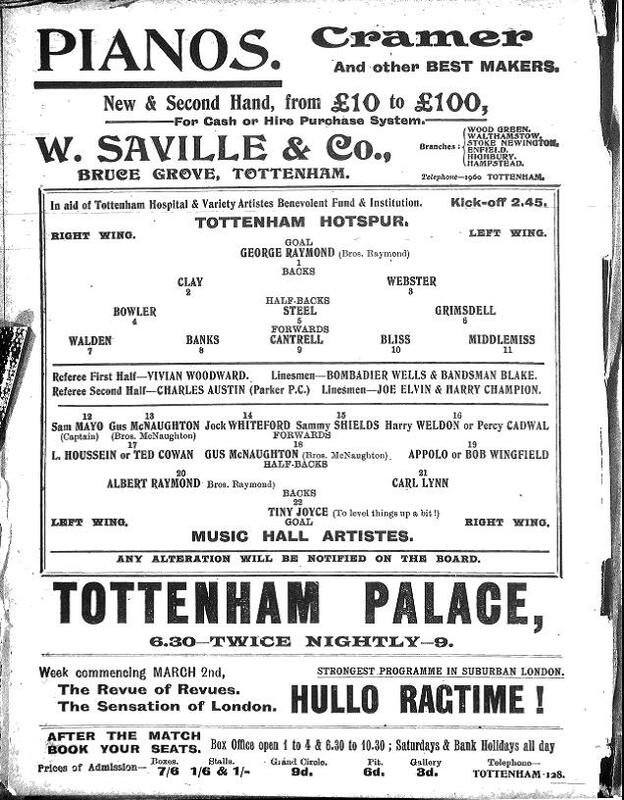 In a historical forerunner of Sport Relief, the stars of London’s music halls and Football League Div One side Tottenham Hotspurs met on a muddy pitch in North London on a wet March afternoon in 1914 to brighten the day, raise a smile and some money for charity. One of the Music Hall Artistes that turned out that afternoon was my Grandfather Gus. Gus McNaughton always kept himself fit. He was a footballer, boxer and athlete – quite apart from being one half of a popular Music Hall Act before First World War. In fact, when war was declared he joined the Royal Naval Air Service, which amalgamated with the Royal Flying Corps to form the Royal Airforce. While he served with the RAF Gus was the services Middleweight Boxing Champion. Not surprising then that he was to find himself in the lineup of a football team that would play a charity friendly against Tottenham Hotspurs in March 1914. Just have a read of the front page of the programme above. Imagine it being read in the RP voice of a Pathe newsreader or Harry Enfield commentating on Arsenal’s Charles ‘Charlie’ Charles. The ‘Artistes’ team included a number famous names of the era including Gus and one Bombardier Billy Wells – the man who banged the gong on the opening titles of many Rank Organisation films. But for the unfortunate breakdown in the weather the attendance at Tottenham Hotspurs ground yesterday, on the occasion of the second annual match with the Music Hall artistes, held in aid of the Variety artistes Benevolent Fund and the Prince of Wales Hospital, would have been considerably augmented, but despite the inclement weather the match drew a tremendous crowd, it being estimated that no less than 15,000 persons were present. Additional interest was doubles created by the presence of the Heavy-weight boxing Champion, who played in the forward line for the Artistes. Punctually at 2:45 Miss Victoria Monks kicked off. Banks at once got away and sending in a fast shot easily defeated the Artistes custodian. Directly afterwards, after some brisk passing, McNaughton broke away, but was intercepted by Walden, who passed cleverly to Steel and the latter had no difficulty in adding a second goal. A penalty for hands was given against Banks but McNaughton sent the ball over the bar. Ten minutes later Cantrell added a third goal for the Spurs from a melee in front of goal, and just before the interval, following some smart work on the part of McNaughton, Carl Lynn reduced the lead with an easy shot. The second half was productive of some interesting play, but no further scoring, although just before time Middlesmiss found the net only to be ruled off side, and the game ended: Tottenham Hotspurs three; Music Hall Artistes one. Teams: TOTTENHAM HOTPSURS: G. Raymond; Clay and Webster; Bowler; Steel and Grimsdell; Walden, Banks, Cantrell, Bliss and Middlemiss; ARTISTES: Tiny Joyce; Albert Raymond and Carl Lynn; Ted Cowan; Gus McNaughton and Bob Wingfield; Sam Mayo, L Houssein, Mark Leslie, Bombardier Wells and Percy Caldwell. 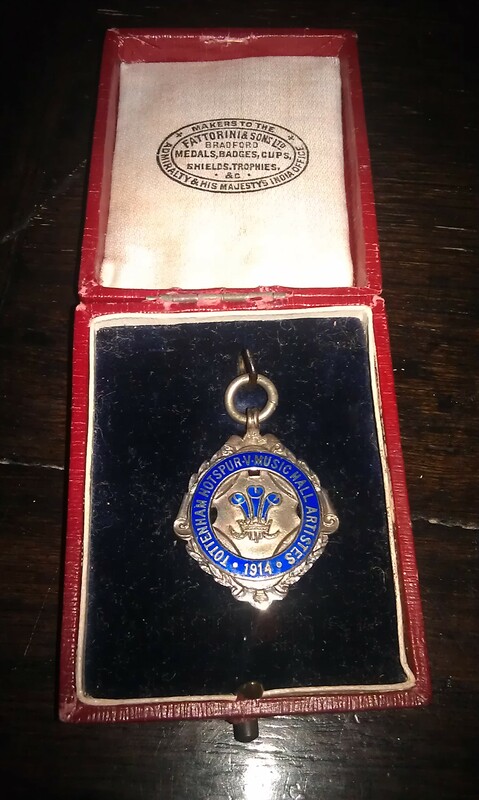 The players each received a commemorative medal after the game. This was Gus’. 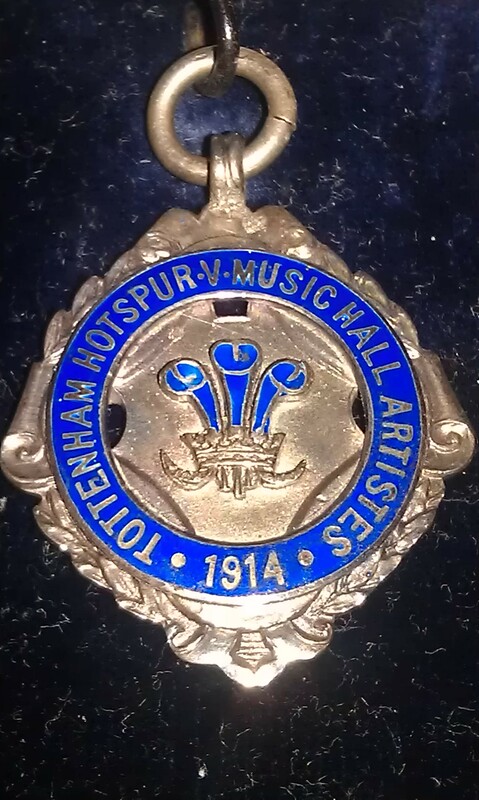 Gus McNaughton’s medal from Tottenham Hotspurs v Music Hall Artistes friendly March 1914. This match was just one example of how the worlds of entertainment and sport provided some of the glue that held British society and its Empire together in a more ‘innocent’ time. For more on this have a look at Jeremy Paxman’s excellent BBC TV series Empire.